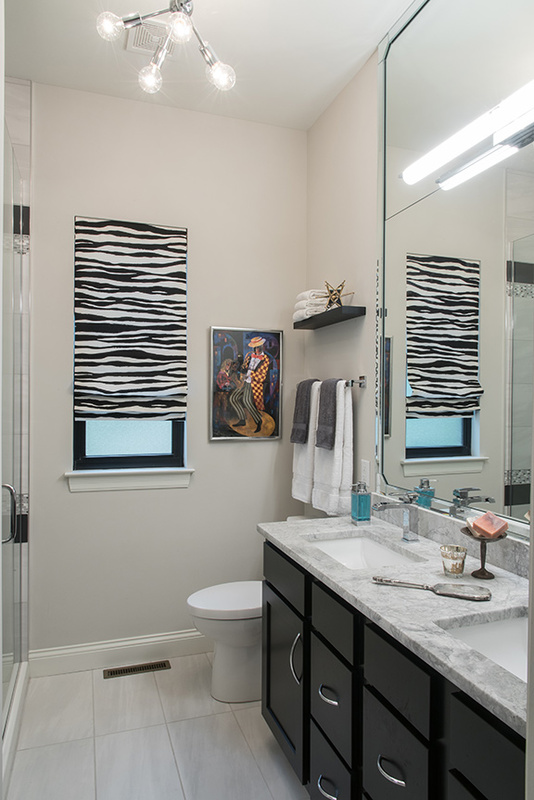 Designer Joyce Mathis doubled as designer and homeowner for her newly built and downsized Central West End home. Mathis carefully selected furnishings that would increase the amount of storage in her downsized Central West End condo. The sitting area features two wingback chairs that belonged to Joyce's mother. 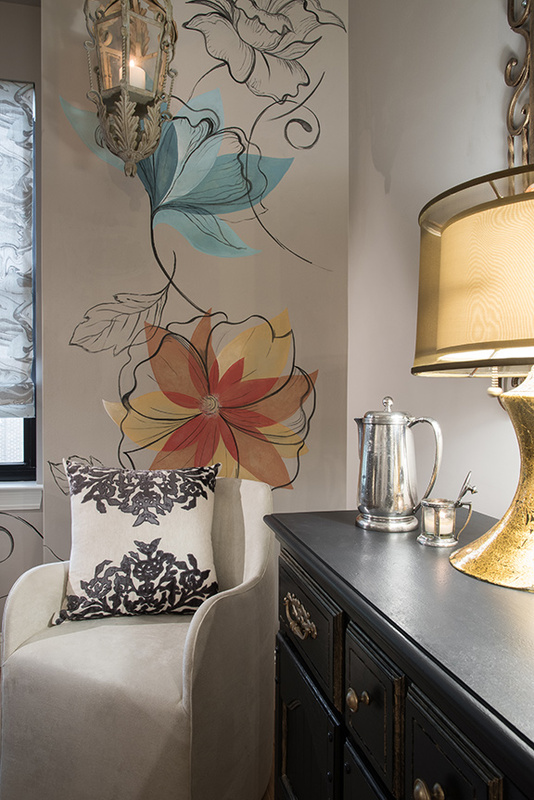 The designer reupholstered the chairs in quatrefoil and leather fabrics to create a cozy nook. The open living space includes the living room, dining room and kitchen. Mathis stuck to a soft, cool color palette to keep the design simple. Hand painted by artisan Susan Greene, the dining room walls were enhanced with a bold floral pattern to add a punch of color. A contemporary chandelier with clean lines hangs above the antique dining table Joyce found and refinished. The kitchen cabinetry was taken to the ceiling for added storage. Brass pulls mix with stainless appliances and chrome fixtures. 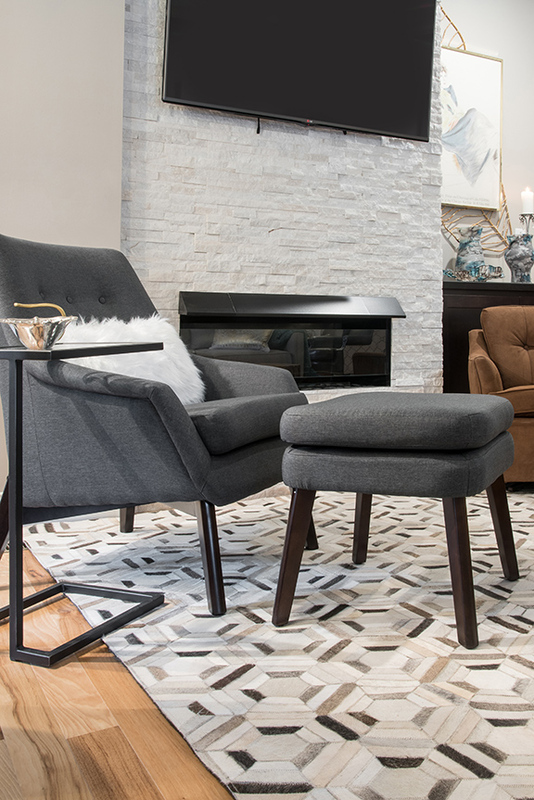 A dark gray armchair has simple lines for a mid-century look and sits atop the geometric-patterened hide rug. The master suite has a 1940s vibe with metallics and furs. One of three bedrooms in the home, the guest bedroom includes a daybed with riser for the couple's visitng children as well as her mom's china cabinet and a window storage bench. After raising their three children in St. Charles, empty-nesters Joyce and Mark Mathis were ready to downsize to a smaller home so they could spend less time keeping up their house and more time focusing on their businesses. Both are in the home industry. 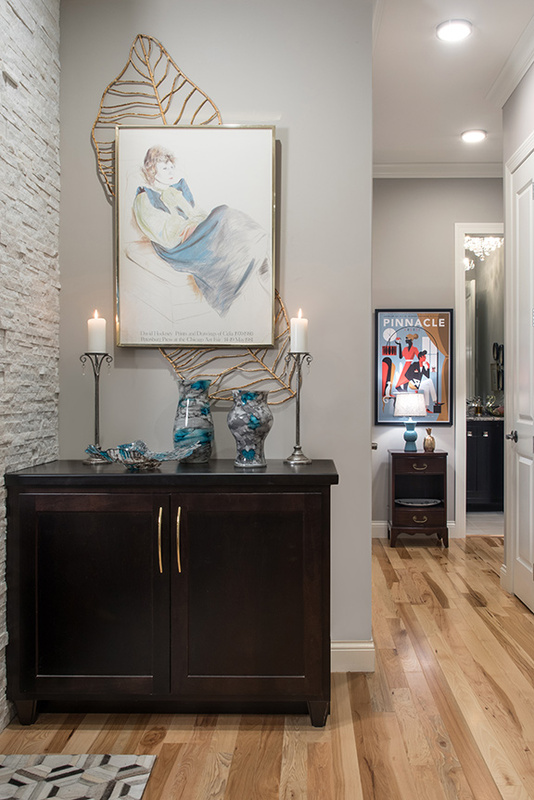 Joyce is an interior designer and Mark, a builder, owns MLM Homes, so when they decided to build new, each of their design talents was able to shine. Finding an infill in the city isn’t easy, so when the Mathises found property in the Central West End neighborhood, they were excited for the possibilities the piece of land could bring. As a custom homebuilder, Mark’s vision for the spot was a two-family condo. The lot was shallow and narrow making it difficult to fit in the requirements for the building, and with no alley a garage was important. Before closing on the property, the Mathises drew up the plans for the building and made the necessary tweaks to gain city approval. They relied heavily on guidance from the St. Louis City cultural resource office and the Central West End architectural review board to design the exterior of the building to fit with surrounding properties. Once they closed, they sold the upstairs unit to a wonderful couple and set to work building their future dream home. When it came time to draw up the layout of the interior, the fun truly began for Joyce. As owner of her firm, MJM Design Company, since 1998, Joyce has transformed the homes of countless homeowners across the St. Louis area. Now it was her chance to turn her dream vision into a reality. The new home had to have three bedrooms, one to be used as an office and one as a guest room for her visiting out-of-town family, two bathrooms, a deck and an open living space for entertaining. “We just kept drawing and refiguring the interior layout until it worked and the architect gave it his stamp of approval,” she says with a laugh. Downsizing from 3,900 square feet to only 1,500 meant Joyce had to squeeze out as much storage space as possible, which she says the most challenging part of the design. 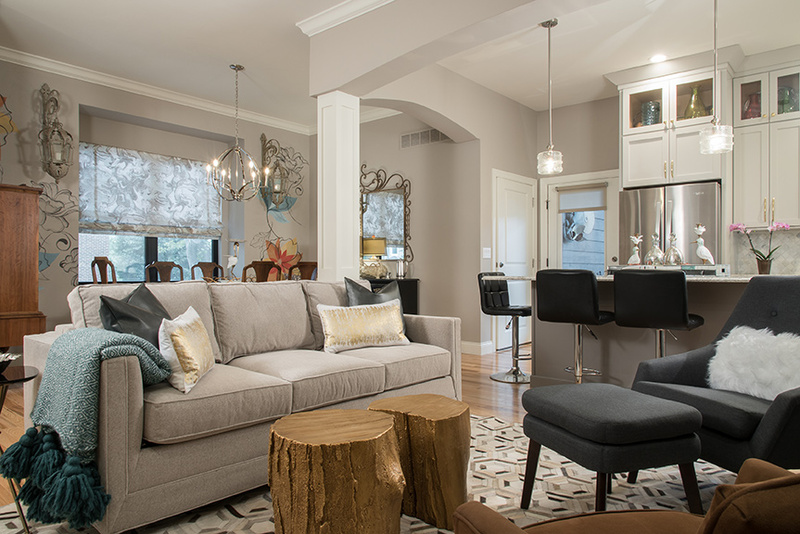 Not only did she have to get creative in adding extra storage options, but also she had to think about each design element in the home from the furniture to the lighting, window treatments and fireplace finish. Nothing could be too big or too bulky. She depended on trusted local vendors like Wilson Lighting, Immerse by Atlas and Stone Trends to help source many of the design elements. The Mathises sold three-fourths of everything they owned bringing only pieces that held sentimental value or would work in the new home. “Our taste had to become smaller in scale,” she says. Clean lines and a softer, cooler color palette helped keep the design simple to achieve a transitional look that was also comfortable and homey. The open living area includes a sitting nook, dining room, living room and kitchen. The floor-to-ceiling stacked stone fireplace in the living area adds textural interest while keeping in scale with the space. The arctic white quartzite dry stack stone from The Tile Shop was chosen for its scale, as it is smaller than you typically see. A simple contemporary fireplace insert gives the homeowners the warmth of a fireplace without an oversized firebox and mantel. It was important to Joyce that the furnishings in the living area not only be smaller in stature, but they had to be durable. The dark gray armchair is upholstered in hard-wearing fabric with a wood frame. The simple lines and frame add a mid-century modern touch. Simple lines are further carried through the space in the Mitchell Gold + Bob Williams sofa and geometric print cowhide rug. Gold trunk stools serve dual purpose as a coffee table or seating for guests when the Mathises are entertaining. Just off the living area and next to the main entry, the sitting nook is a great place to kick up your heels and enjoy a good book. 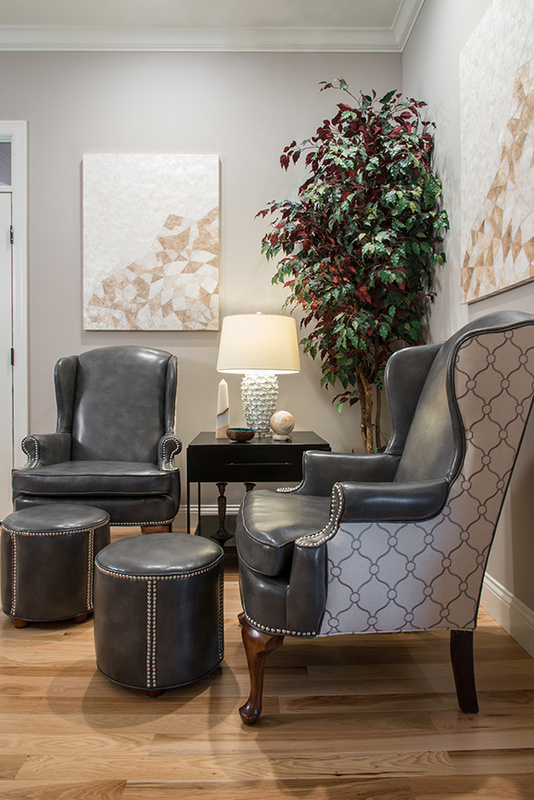 Joyce reupholstered two of her mom’s wingback chairs with a quatrefoil fabric and leather combination. The smaller wing coupled with the tiny stools tuck perfectly into the space. And for storage, Joyce selected an accent table from Mitchell Gold + Bob Williams that has a shelf and a drawer for ample places to hide away magazines, remotes and more. Storage in the dining room includes a chest and hutch to house Joyce’s china and linens. The dining table made the move from St. Charles with the Mathises. You’d never guess by looking at it now, but Joyce found the set tucked away in the basement of Gringo Jones. Painted off-white, she fell in love with the legs and snatched up the find. She had it refinished to its original condition by Dip N Strip in St. Charles, who during the process revealed a beautiful walnut underneath the layers of paint. 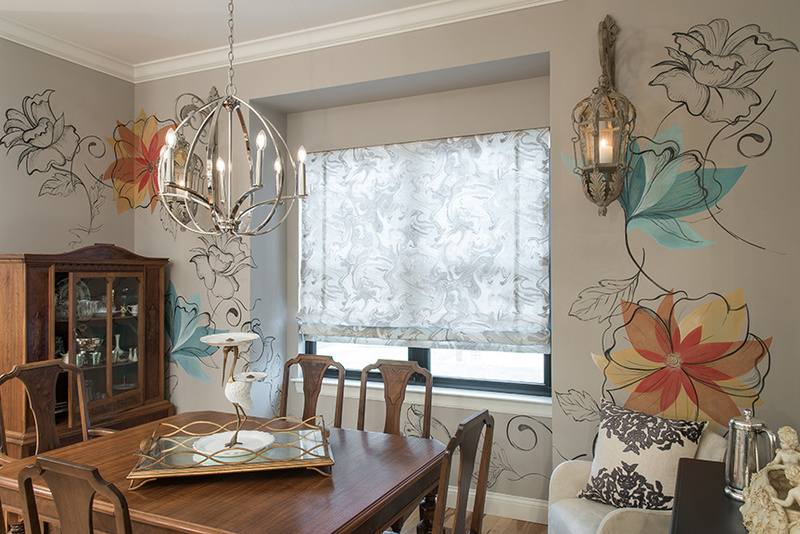 And speaking of paint, the dining room features an artistic and colorful mural by Susan Greene of Paint Imagery. “I knew I wanted to paint the wall of the dining room because everything else in the living space is more monochromatic,” Joyce explains. So she chose big flowers done in brighter colors. “It was my way of adding something bold,” she says. In the kitchen, Joyce adds a bold touch by mixing metals; a look she agrees is so on trend right now. 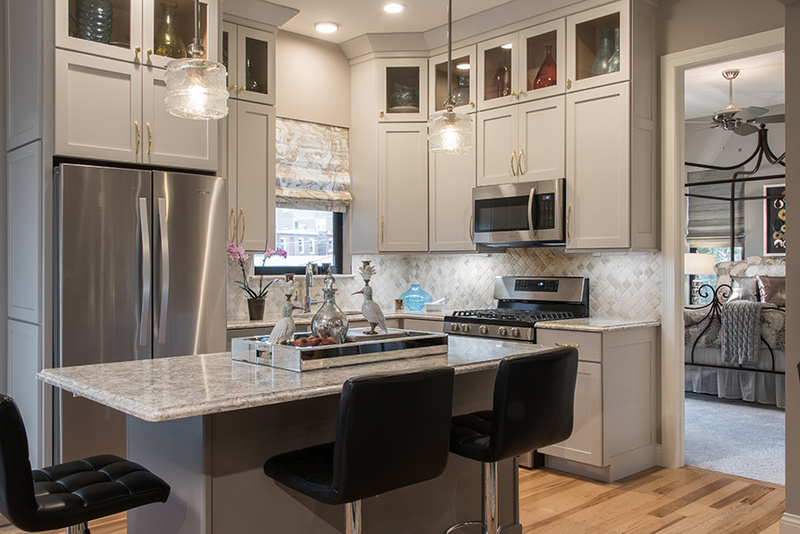 Brass pulls on the RSI Kitchen & Bath cabinetry, which are finished in oyster and taken all the way to the ceiling for added storage, blend with the stainless appliances and chrome fixtures. The soft gray and white shades in the backsplash tile and Cambria countertops from Stone Trends complement the cooler color palette, which is continued in the master bedroom. Joyce’s original vision for the room was Hollywood glam, but because of space constraints she settled for a more subtle, yet sophisticated 40s vibe with furs and metallic. 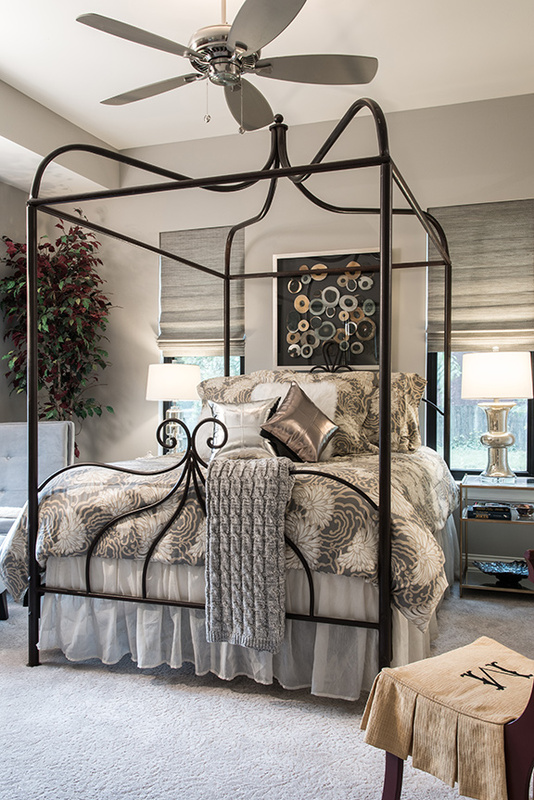 The metal frame canopy bed draws the eye toward the ceiling. Tables from West Elm serve as nightstands and provide lots of storage with two shelves. 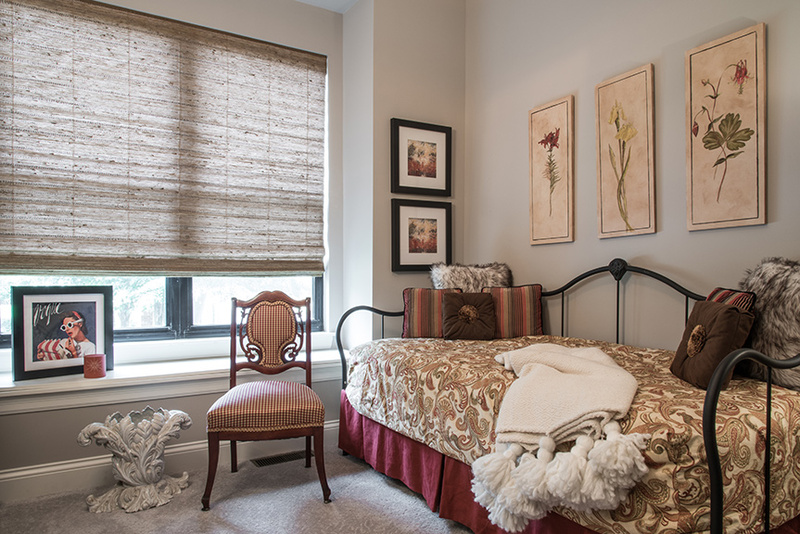 The window treatments add a layer of texture and hominess. “I like to layer window treatments when I can,” Joyce explains. In the master, lined shades for privacy are finished off with a decorative panel from The Shade Store. 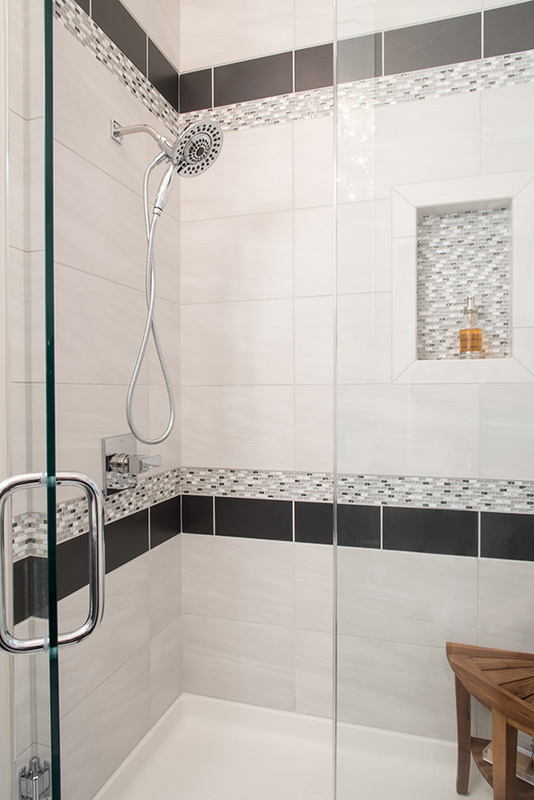 The couple took advantage of the height in the master bathroom by taking the vanity mirror and shower tile all the way to the ceiling. They also squeezed out as much storage as they could in the double vanity. 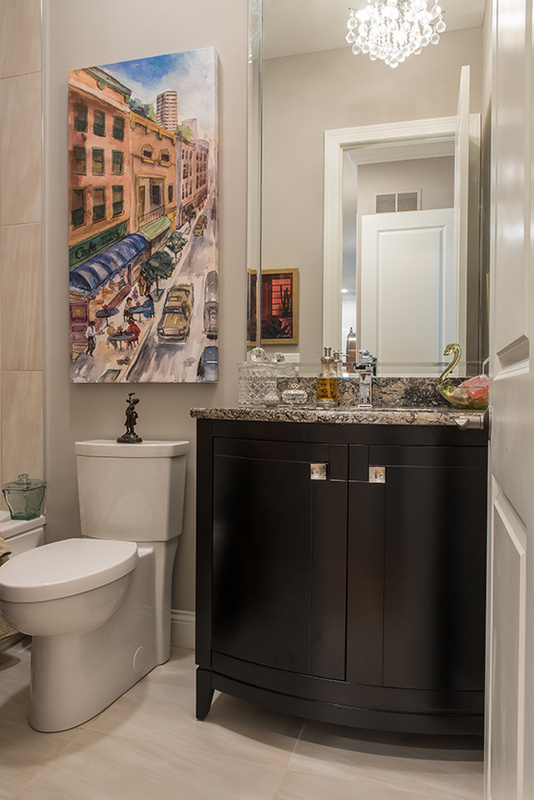 A powder room, an office and a guest bedroom complete the quaint home. Joyce made sure each room would provide ample storage with closets that have shelving to the ceiling. Maximizing their space with storage and scaled-down furnishings, Joyce and Mark prove that a downsize doesn’t have to be a downgrade. The couple has created a grand residence that allows each of their professional talents to shine, and they are embracing and inspired by their new urban way of life.